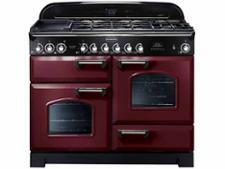 Range Cookers Jargon Buster - Which? From pyrolytic cleaning to hotplates, our A-Z jargon buster explains the terms you need to understand when buying a range cooker. Range cookers have a range of different functions and features, and it can be hard to know what they all are and whether they're useful. Here, we explain all the terms you'll come across when buying a range cooker and, more importantly, whether they're worth having. Once you know which features are must-haves for your new range cooker, head to our range cooker reviews. We've tested models from Indesit, Rangemaster, Smeg, Stoves and many more, and have found that pricier models don't always cook the best. These are rough surfaces inside some range cooker ovens that catch, absorb and break down food spills. 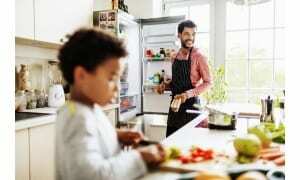 These spills are then burned away during normal cooking, making your oven easier to keep clean. Catalytic liners may be found on the sides, back or roof of an oven. Most range cookers are dual-fuel range cookers, which means they come with electric ovens and grills, and a gas hob that will usually include one large burner. 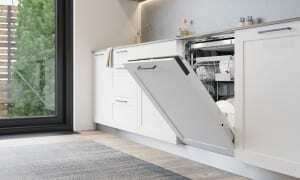 These generally have a ceramic hob, electric grill and two ovens, one of which is likely to have a fan to help distribute the heat evenly around the oven cavity. 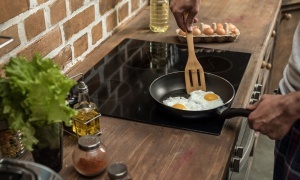 Induction hobs (see below) on electric range cookers are becoming more widely available. One of the most important parts of our tests is looking at how quickly and accurately each range cooker heats up and how evenly it cooks. We've seen cookers that overheat by as much as 30°C, and ones that will leave the edges of your shortbread overly crisp and the middles too pale. Visit our range cooker reviews to see which models excelled in our tests. A fish burner covers the space of two standard-sized gas burners and is designed to be used when steaming a large fish in a fish kettle. It can also be used with larger pans, griddles and hotplates. These devices are found on gas hobs. They shut off the gas supply if the gas fails to ignite or gets blown out. Range cookers can be fuelled by gas, electricity or a combination of the two. See 'gas range cookers', 'electric range cookers' and 'dual-fuel range cookers' (all in this jargon buster). come with gas ovens and a gas hob. They have the lowest running costs of all types of range cooker. There are fewer to choose from than dual-fuel models, but we have tested gas range cookers made by Belling, Leisure, New World, Rangemaster and more. These large cast-iron slabs can have flat or ridged surfaces. They're heated by the gas burners and are excellent for searing meat and vegetables, with the ridges leaving characteristic lines on the food. Flat griddles can be used to prepare pancakes or fry eggs. Most range cookers have at least four burners for frying, simmering and boiling, and some have as many as eight. These may be gas, electric or electric induction. Some models have extras, such as a larger cooking space for big pans, or a super-hot wok burner. Our tests have shown big differences in cooking time and quality between hobs. Some take three times as long as others to heat a pan of water to boiling point, while others heat the pan unevenly, so you'll need to stir constantly for even results. A stainless-steel hotplate can be used for greasy-spoon-style cooking of bacon and eggs, or like a Japanese-style teppanyaki plate for quickly sizzling meat, shellfish or vegetables. 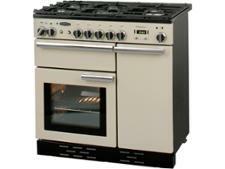 Range cookers with induction hobs are quick-heating and easy to control. Induction hobs are becoming more common on expensive range cookers. We've tested models with induction hobs from brands including Belling, Rangemaster, Smeg and Stoves. Multifunction ovens allow you to cook with the heating elements independently or in combination. Heating with the lower oven heating element and the fan is good for pizza, and using the grill in combination with fanned heat is good for meat. 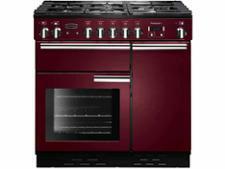 Some range cookers come with pyrolytic oven programs, which burn off dirt and grease at temperatures of more than 400°C. Afterwards, all you do is sweep away the ash. Pyrolytic programs take around two hours and, for safety reasons, the oven door will lock during the self-cleaning program. Pyrolytic cleaning programs aren’t standard on range cookers, but are a feature to look for if you particularly dislike cleaning your oven. Bear in mind, however, that the pyrolytic function doesn't clean the shelves or oven door. Some range cookers come with roasting trays that can be attached to the inside of the oven door – so when you open the oven door, the tray swings out with it. This means that you don't need to reach into the oven when roasting meat or vegetables. As part of our range cooker tests, we put a plastic family-sized turkey into the oven in a roasting tray to check how much usable space there actually is inside the cooker. It can often be different from the manufacturer's claims, so make sure you take a look at the technical specifications in our range cooker reviews before you buy. These allow you to slide a shelf out smoothly, and the safety mechanism stops it from coming out completely. 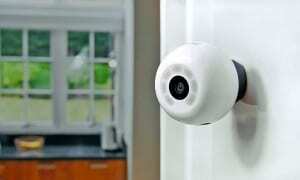 They make cooking and baking easier and safer. Traditional range cookers vary in width between 90cm and 150cm, but you can also buy mini range cookers that are smaller, at 60cm or 70cm. A high-powered wok burner can be used for frying or rapid boiling. Wok supports provide a cradle to hold a large wok and keep it stable. They also raise it slightly to direct a fierce heat towards the bottom, allowing food to be seared quickly. Now you know the features to look out for, head to our reviews to find the very best range cooker that will be ready to cook quickly and will bake evenly.